With Doctor Who returning on Saturday, I’m recapping the previous episodes of season seven thus far. Today it’s the beginning of the end for the Ponds, The Power of Three. You just married Henry VIII … on our anniversary! Chris Chibnall’s second episode of the season (after Dinosaurs on a Spaceship) is nominally about the power of three – as in the Doctor, Amy and Rory – which, in mathematical terms, is ‘cube’. But in reality this Amy/Rory-centric episode is more an exploration of duality. In many ways the story crams an awful lot of ideas – many of them subtle and heart-rendingly poignant – into its 43 minutes, but as a result the plot itself becomes awfully rushed, with the Doctor overcoming a genocidal threat and the apparent death of one-third of the world’s population with a simple flourish of his sonic screwdriver. Like the Shakri hologram – wonderfully underplayed by a heavily disguised Steven Berkoff – the threat lacks any real substance. That’s not to say there isn’t much to enjoy here. If Dinosaurs was all bluff and bluster, then The Power of Three is a more introspective episode more in the manner of other Earth-based pre-finale offerings The Lodger and Closing Time. (Yes, I know next week isn’t the season finale, but it is Amy and Rory’s final bow, so it’s as good as.) The duality of Rory and Amy’s lives – like comic book heroes, their real-life personae are effectively their secret identities – are examined deftly, with strong hints that after ten years of travelling with the Doctor (by Amy’s estimate) they are ready to cut the umbilical cord and strike out into the real world. Rory takes on a full-time job and Amy (now a travel writer) says yes to becoming a bridesmaid. We get to see another side of the Doctor too, the restlessness and relentless energy that drives him when he is not embroiled in saving the universe. Here is a Time Lord who needs to be busy, who when he isn’t mows lawns, paints fences, and plays keepy-uppy just to occupy one hour. Like the TARDIS, the Doctor is capable of cramming an awful lot into a small space. I’m not running away from things – I’m running to them, before they flare and fade forever. I’m running to you and Rory before you fade from me. This echoes an earlier conversation with Rory’s dad Brian (Mark Williams), where the Doctor recognises that in some way he always ends up losing his companions while he marches onwards through time and space. It’s an acknowledgement that the Doctor needs his companions as much as they need him for the adventures he opens a door to, and that in many ways his greatest fear is the inevitability of that loss. Finally on the theme of duality we have the twin orderlies who are whisking people away to the Shakri spacecraft – I’ll come back to those in a bit. The lightness of the story is enhanced by a series of in-jokes and familiar tropes which will have delighted regular viewers. Of course, there is the return of both fish fingers and custard (which harks right back to Matt Smith’s first story, The Eleventh Hour) and UNIT, headed now by Kate Stewart (perfectly portrayed by Jemma Redgrave), the daughter of Brigadier Sir Alistair Gordon Lethbridge-Stewart. The use of news reports and other TV clips as a short cut to exposition is a nod to one of Russell T Davies’ favourite devices, enabling cameo appearances by BBC newsreaders, Brian Cox and Alan Sugar. And I thought I also saw a couple of doll’s masks on a shelf in Amy and Rory’s house, which may have been a nod to Night Terrors, but looked more like a reference to the clockwork robots from The Girl in the Fireplace (a Tenth Doctor/Rose Tyler story). And finally, one for long-time fans, we miss out on an adventure in Victorian London involving a Zygon ship under the Savoy hotel – a nod to a Tom Baker story which offered an extra-terrestrial explanation for the Loch Ness Monster. I’m sure there are many other references I missed on first viewing, though. Brian: criminally underused. Such a shame, as he was many viewers’ favourite part of Dinosaurs on a Spaceship. Too many loose ends. The little girl/outlier drone and the orderly twins made for cool monsters of the week, but did they really serve a purpose in terms of the story? The orderlies were little more than a plot device to up the threat level and transport the action on to the Shakri ship. The girl seemed to serve little purpose at all. The wormhole portal is located in Rory’s hospital. How convenient. The resolution is too quick, too pat. One wave of the sonic and a genocidal threat is dispensed with, conveniently blowing up the Shakri vessel in the process. I understand that the Doctor’s solution is to use the cubes to implement a worldwide mass defibrillation, but in the intervening time wouldn’t many people have been moved away from the cubes by medical staff? Wouldn’t mass heart attacks have resulted in plane, car and train crashes resulting in the irreversible deaths of hundreds of thousands? (Yes, it’s FlashForward all over again.) And just how long elapsed between the original cardiac arrests and the defibrillation? The human body can survive for a few minutes – but only a few minutes – without a functioning heart before vital organs suffer irreparable damage. The Doctor had to travel from UNIT to Rory’s hospital and then face off against the Shakri in that time. I know he can accomplish a lot in an hour, but I doubt even he could move from A to B to C that fast. Yet again. 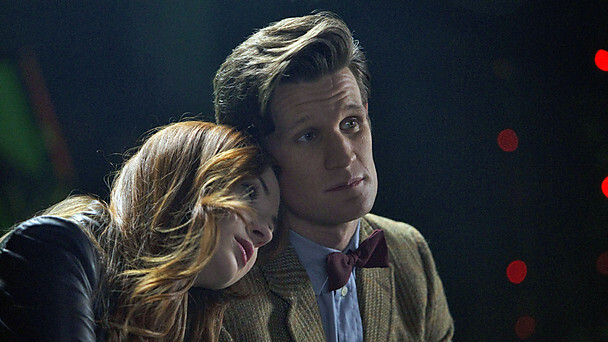 despite this being an episode revolving around them, the Ponds are largely reduced to window dressing – other than that chat between Amy and the Doctor. Overall, there was much to enjoy on many levels in this more introspective and character-driven episode, but there were too many loose ends and neat resolutions to make it a great story. It would have benefitted from an extra 5-10 minutes of run-time to either expand the rather perfunctory Shakri threat, or to delve more into Amy and Rory’s real lives and their relationship with the Doctor. As such, this was merely okay. Next week: It’s Amy and Rory’s big farewell and the return of River Song as The Angels Take Manhattan. Please let this be a fitting send-off and not be the abomination that was Daleks in Manhattan. Please?